Kral redefines their Puncher Pro PCP Air Rifle with this new 500 cc tank version. The large tank adds even more air capacity and shot count to an already air efficient platform. 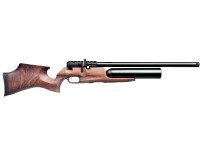 Take up to 80 full power shots on a single air charge in .177 and .22 and expect up to 70 goos shots in .25. Blending traditional Walnut stock styling with a modern looking action, the Puncher Pro 500 is a real head-turner. With an adjustable two stage trigger and on board power adjuster, the Puncher Pro 500 is easy to fine tune to your liking. The smooth side lever action is easy to use and each rifle comes with two magazines to keep the shots coming. Hawke Match 1" Rings, High, 9 to 11mm, 2 pc.